The Hytrol Model 190-LR Belt Driven Live Roller Conveyor is a belt driven live roller conveyor designed to transport medium to heavy cartons. 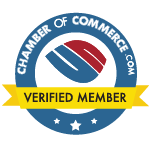 Applications vary from manufacturing to distribution operations. 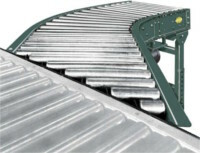 The Hytrol Model 190-LRS is a live roller spur conveyor ideal for diverging or converging applications. 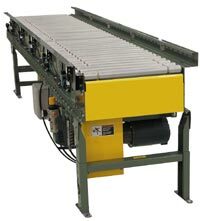 This conveyor is ideal for the transfer of cartons and boxes onto and off of main conveyor lines. This model may either be self-powered or can be slave driven from ACC or LRC conveyors. The 190-LRS is available in both 30° & 45° spurs and is equipped with mounting brackets to attach the unit to the side channel of 190-ACC, 190-ACZ or 190-LR. 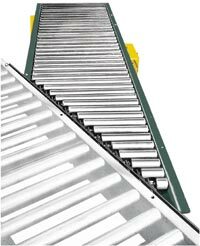 The Hytrol Model 190-LRSS is a live roller straight spur conveyor that is ideal in diverging or converging applications. 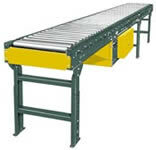 This conveyor is used for the transfer of cartons and boxes onto and off of main conveyor lines. This model may be self-powered or can be slave driven from ACC or LRC conveyors. The 190-LRSS is available in 30° & 45° spurs and right or left hand units are available. The Model 190-NSPEZ Zero Pressure Accumulation Conveyor is a horizontal live roller conveyor designed for Zero Pressure Accumulation of product. Positive braking in each zone reduces the possibility of damage to fragile items during accumulation. 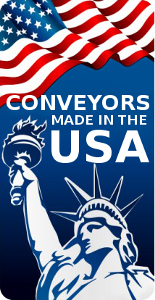 Singulation feature allows products to be removed from any location on the conveyor.